The molebabe rolled out a small patch of pastry, spread it thick with honey and placed on it a strawberry and a raspberry. 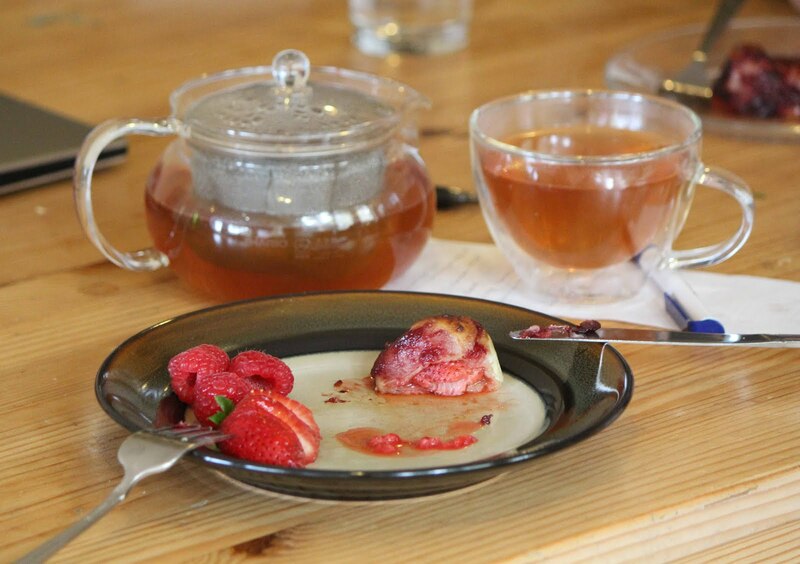 Wrapping the pastry carefully over the fruit, he coated the lot with a mixture of honey and damson juice. It looked nothing like a honeyed mole, but the molebabes thought it did. Gurrbowl licked his digging claws proudly and added his ‘’unnymole’ to several others on a tray, ready the go into the oven. He wrinkled his nose proudly at skipper. When I was about nine or ten, I raced my way through the Redwall books, devouring each one I could get my paws on. When I didn’t have a new one to read, I re-read my favorite tales of Redwall – perhaps none more than Pearls of Lutra. I loved the riddles and puzzles the abbeyfolk had to solve to save the day – it was a little bit like The Da Vinci Code starring rodents. 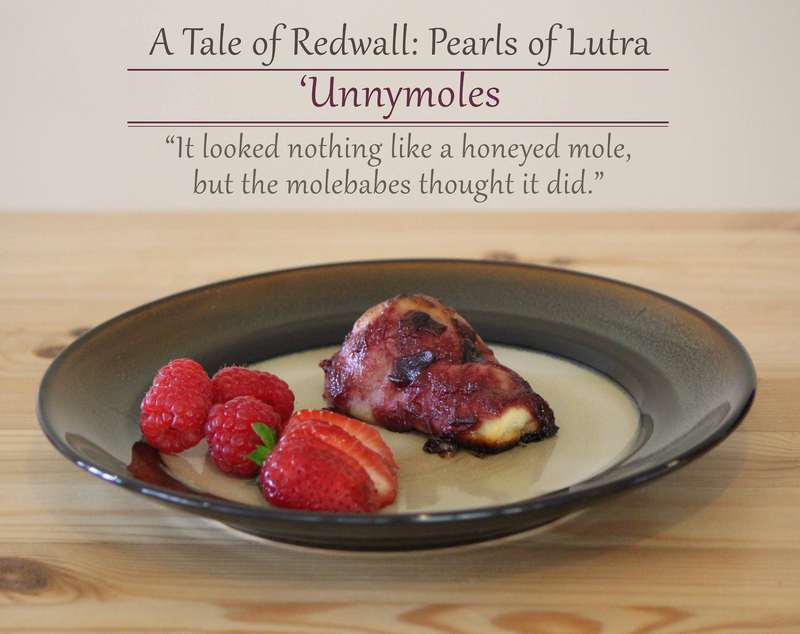 So, for inspiration for a Redwall August recipe, I went first to Pearls of Lutra. Honeymoles, or “‘Unnymoles,” as chef Gurrbowl calls them, seemed like a particularly fun dish to recreate since the entire process is described clearly in the books. I also loved the idea of crafting something that could conceivably look like a mole if you tried really hard to think like a molebabe. so I made my sauce with black plums and red wine. 1. Dice the plums, and combine in a small sauce pan with 2 tbsp honey, the red wine and the spices. 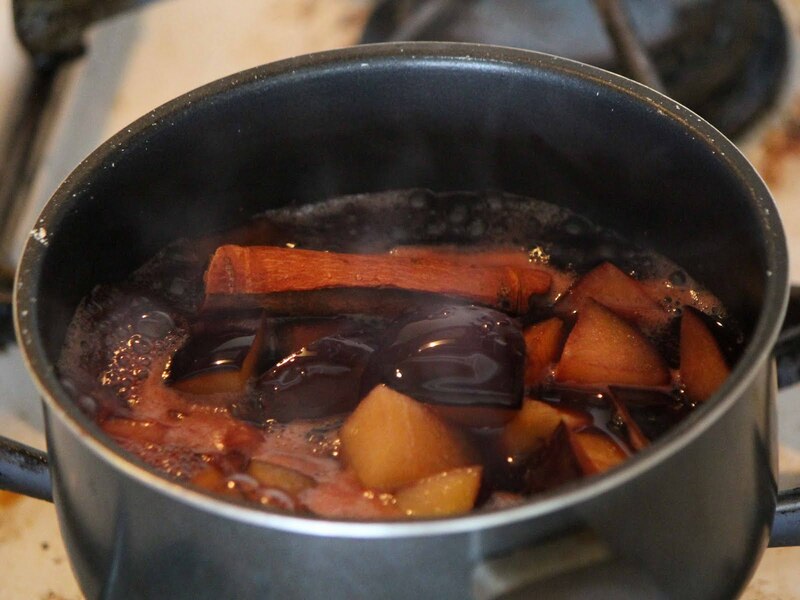 Simmer on low heat until the plums fall apart and the mixture thickens, around 20 minutes. 2. Meanwhile, clean the berries. 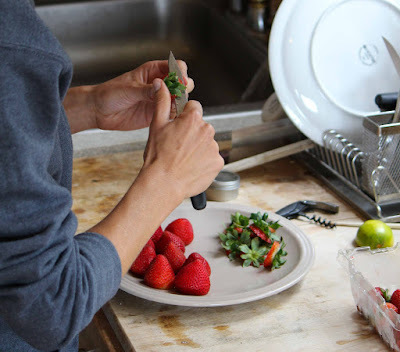 Slice the leaves off the strawberries. 3. Line a cookie sheet with parchment paper, and preheat oven to 400F. 4. Roll out your puff pastry dough into a large rectangle according to recipe or package instructions. Using a knife, cut into thirds. Then, cut each third with two equally spaced slanted lines pointing towards each other to give three trapezoids per third. This shape makes it a little easier to fold into moles, since the mole butts (strawberries) are rather larger than the mole heads (raspberries). 4. Spread each trapezoid with about 1 tsp honey. 5. Place one raspberry in the narrow part of the trapezoid, about half an inch from the edge, pointed towards the edge. Nestle the tip of a strawberry into the crevice of the raspberry. It should start to look vaguely mole-like, if you have a very active imagination. That definitely looks like a mole. 6. 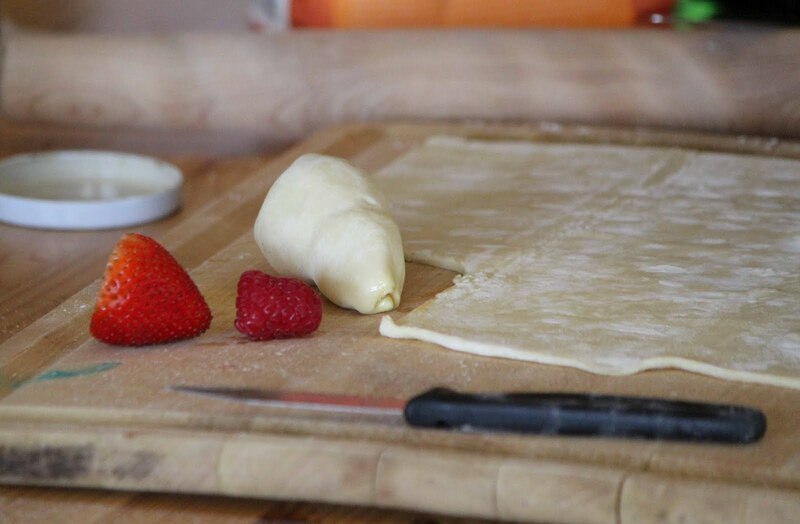 Fold the dough over the berries, stretching slightly if necessary. 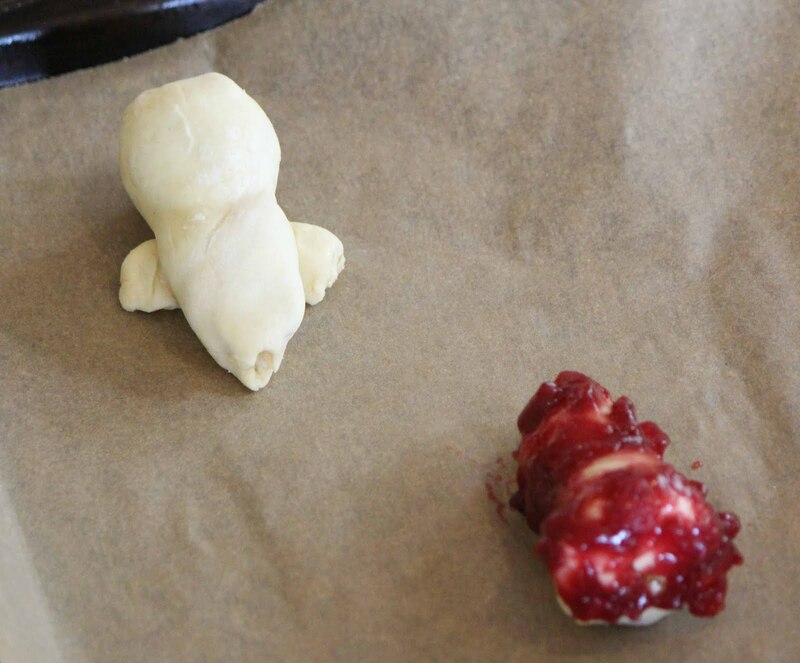 Pinch the dough to seal. Pat the nose into a cute little point, and flatten the folds around the mole bottom. Flip the pastry upside-down, and place onto the cookie sheet. 7. 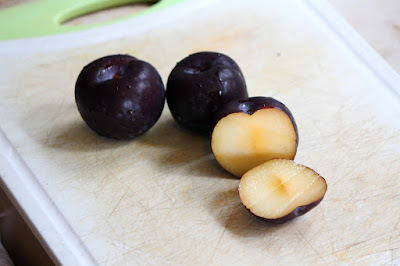 (See Concluding Thoughts below for how I would modify this step) Spoon one tablespoon of plum sauce over each mole, coating evenly. 8. Pop the pastries into the oven, and bake until the dough has puffed and browned, about 23 minutes. 9. Cool for 15 minutes, or until you can’t bear to wait any longer. 10. Hurr, that’n be ‘ow t’make ‘unnymoles, zurr! 'Unnymoles are delicious with tea. Moles are certainly skilled bakers. The ratio of fruit to pastry in this recipe is perfect. The fruits are tender, but not mushy. Each bite is tangy, not too sweet nor too sour.